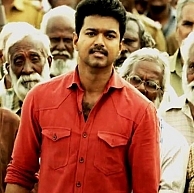 Ilayathalapathy's 'Vijay 58' is currently on a shoot break now, thanks to Christmas and the New Year celebs. The schedule will resume in Chennai on January 2 and will go on till 20th in the city. The team will then move on to Thalakonam, Kerala and finally to Punjab to can an important climax stunt scene. We have to see if there is a Pongal special update from the team to satiate the appetite of all eager fans. We would keep you posted. Kamal's dream, Marudhanayagam will resume ! Cheran's JK along with I and Yennai Arindhaal ! Suriya's disapproval on the prank played on him ! AR Rahman, Ilayathalapathy Vijay And Vikram For Shankar’s Next! People looking for online information on Chimbudevan, Ilayathalapathy Vijay, Vijay 58 will find this news story useful.